The specific geometric designs that are the hallmark of Tiwi art are usually applied to a dark background. In a bold move around 1997 Kutuwalumi Purawarrumpatu, also known as Kitty Kantilla, reversed this aesthetic and began to produce paintings of delicately painted dots and lines on white. The white background helped give the paintings a light, ethereal quality and marked a strong contrast with her previous works painted on black such as the three works in the Art Gallery of New South Wales collection, acquired in 1995. The decorative motif mulypinyini amintiya pwanga (lines and dots) forms a common basis for many of the abstract designs that are said to have no specific meaning. 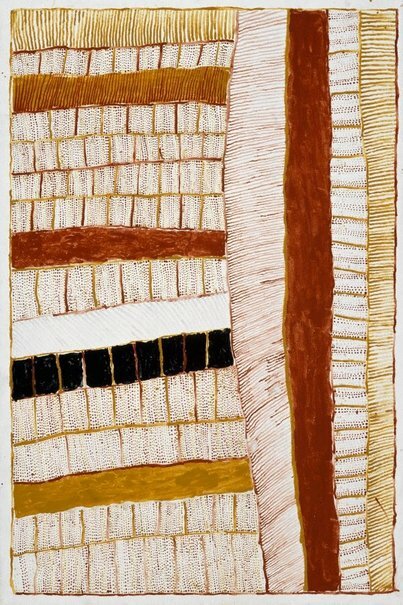 The imagery in these paintings, like that of most Tiwi art, is derived from the jilimara or ceremonial body painting and the decoration applied to Pukamani funeral poles and associated ritual objects made for the Pukamani ceremony. Traditionally the participants in funeral ceremonies decorate themselves with a rich variety of ochre designs so as to conceal their true identity from harm by malevolent mapurtiti (spirits of the dead). Thus Tiwi art generally avoids reference to totems, Dreamings, or stories connected with the palaneri or Creation Period. Kutuwalumi Purawarrumpatu's legacy is continued in the work of artists such as Pedro Wonaeamirri whose works demonstrate the continuation of Tiwi traditions with his own innovation of design and aesthetic.